SAN FRANCISCO – Oct. 24, 2013 – UNIGINE Corp. announces the launch of Oil Rush on iOS devices today for $4.99. Dominate the seas in this post-apocalyptic naval strategy game where oil is key to survival. What is left between the endless ocean and the burning sky…is war! Oil Rush takes place in a world where nuclear war has melted the ice caps, changing the face of the planet forever. The game features group real time strategy and global decisions; plan ahead as every single swipe counts. Get ready to embark in fierce battles between armies striving for the last remaining supplies of oil. 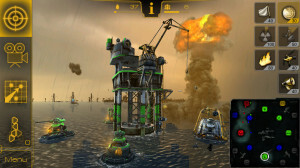 Capture, upgrade, and defend floating production platforms, while pumping black gold to feed your naval and air forces. Smash through onrushing waves of enemies while experiencing a thrilling story of apocalypse, military technology, and never ending battles! UNIGINE Corp. is an international company with a long-term commitment to bring the best quality products and services to its customers. Over 8 years on the market, the company offers top-notch real-time 3D solutions for video games development, scientific research, simulation, visualization, serious games, virtual reality systems and more. UNIGINE is a leading company providing a lineup of GPU benchmarks such as Sanctuary, Tropics, Heaven and the newest Valley benchmark. 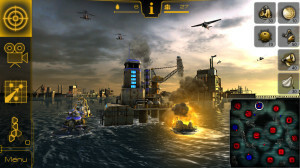 It has also released the Oil Rush naval strategy game for mobile devices. Rahat Rashid, TriplePoint for UNIGINE Corp.